This handbag is real investment every woman wants to make when it comes to the wardrobe department. So, dare to bring some ethnic vibes into your daily outfit! As this bag features colorful embroidery, it may seem the best variant for spring or summer. It has the hint of sunshine and anticipation of the next spring, so you can wear it even in cool winter and autumn days. Made of genuine leather that is totally washable. Has one compartment with top zipper. With a long adjustable strap to turn a clutch into a shoulder bag. The strongest handles will carry the heaviest craft supplies. Perfect for traveling or just to carry it as an everyday bag. 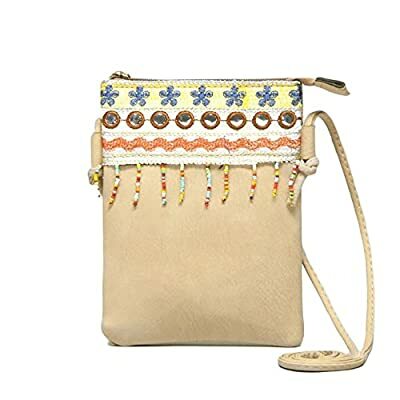 Made in ethnic style; has colorful embroidery and several tassels (every tassel is in different color). The best gift for all women and girls. Wipe your clutch once a week with warm, soapy water. Avoid scrubbing with a brush. Do not use baby wipes for cleaning and stain removal. Do not bleach or iron. Try a professional leather cleaning agent on tough dirt or ink marks. Do not leave your bag in contact with moisture for a long time. Keep your clutch stuffed while you aren't using it. Do not leave your bag under direct sunlight - that could cause fading. Whimsical and fun, this small bohemian bag decorated with colorful embroidery and beading is sure to attract attention. It is a statement piece that will carry your essentials in style. Being very stylish and bright, this bag gives maximum protection and easy access to your essentials. A very sturdy, well-crafted bag with great attention to detail. The outer part of the bag is made of faux leather that is pleasant to touch. The material provides great resistance against impacts and guarantees a long life. The internal surface is made of excellent synthetic materials which provide durable using. Dimensions: Length - 5.9" , Width - 0.4". Height - 7.8". RedCube is a registered trademark. This item is ONLY fulfilled by Amazon and seller "RedCube LLC" We are sure about high quality of our bags. However, if you are not happy with your purchase, we can offer you a 100% refund. Please CONTACT US if you have any questions about this or other items. You can also visit our shop for other lovely goodies!